Spring is taking its time arriving, the early occurrence of Easter a false start to the season. There’s very little to forage from the garden, though we found a sprouting onion in storage that we’re keeping for the greens. 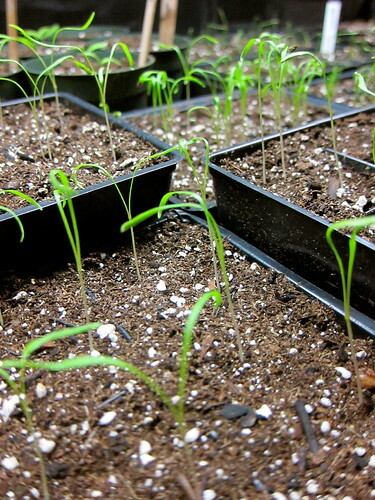 The emergence of seedlings never fails to delight us. The leeks and onions are shouldering up through the soil, proffering their tender leaves like victory flags. We somehow ended up with three kinds of fennel this year — Finale, Perfection, and a new one, Orion. The celeriac are finally poking through, while the Shishito peppers lag. It’s our first time growing peppers, and we don’t know what to expect; we wonder if the soil’s too cold for them to germinate. Coming full circle, the Aprile tomato seedlings are coming up while we’ve still a tray of winter tomatoes, or pomodorini, left in storage. We’ve finished consuming the Aprile first, and are now making our way through the last of the Ponderosa pomodorini. These tomatoes were harvested in early October, and kept in a single layer on trays lined with paper. This entry was posted in garden, tomatoes / pomodorini and tagged alliums, fennel, leeks, pomodorini, tomatoes. Bookmark the permalink. Wow, I can’t believe you have tomatoes that have stored this long! That is great! Lots of great looking seedlings you have going there. It will make for a wonderful summer garden! 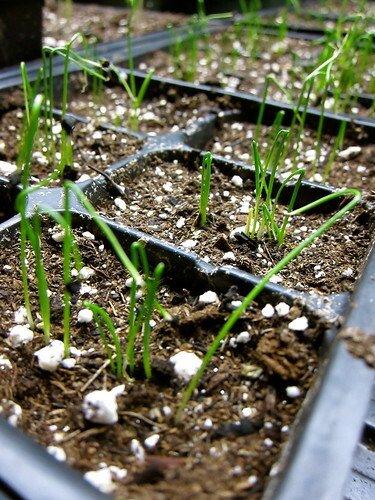 It’s an awfully chilly Spring here so far, but exciting to see your seedlings! How did you store the tomatoes and at what temperature-ish? Tomatoes were stored in the basement (next to the winter squash), temps hovering in low 60’s. Are the trays you stored the tomatoes on solid or were there spaces for air to move through? The trays are open coated wire mesh to allow for air circulation, with a layer of newsprint paper underneath the tomatoes to absorb any excess moisture and protect them from resting directly on the mesh. 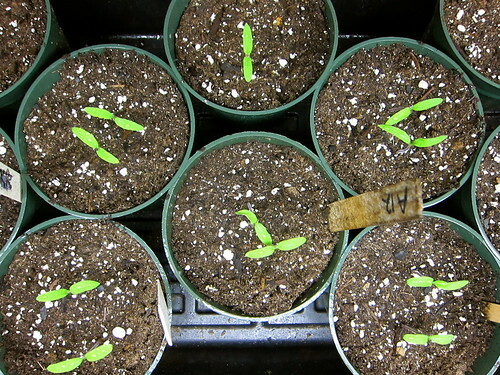 I just love seeing new seedlings. Hard to believe such slender, delicate things can survive. Nice work on winter storage of the tomatoes. I’d never thought to let my onions sprout and eat the greens. I do miss fresh greens in the winter. Your tomatoes are a wonder – you seem to have perfected the technique of storing them for winter. How is the taste an texture of the over wintered tomatoes? Do you prefer one variety over another? 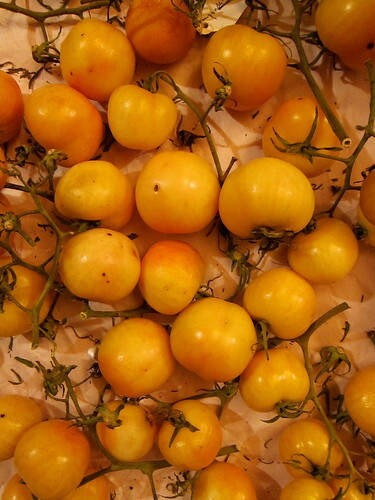 Unlike slicer tomatoes, the winter ones are better cooked than eaten raw. The red Aprile were better tasting, however the more acidic Ponderosa stored for much longer. Wow, I couldn’t store tomatoes over2 months here, you must have the ideal temp for them. The overwintered tomatoes are really impressive but its the fennel seedlings I love the most, so delicate, so beautiful. 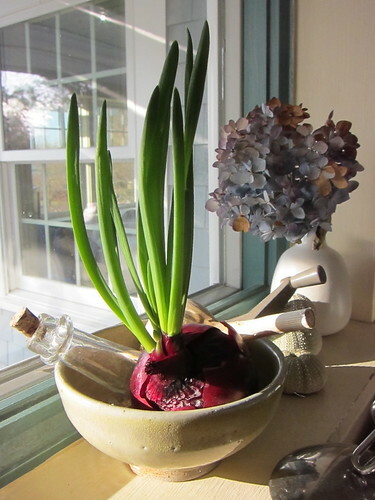 the sprouting onion is a rock star!